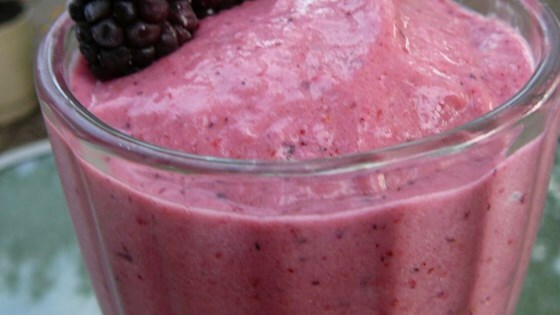 In a blender, combine frozen fruit, canned fruit and honey. Blend until smooth. Intense, indeed! In fact soooo intense that I had to cut the intensity with 1/2 cup plain yogurt. I also reduced the honey to 1T. Very Very good, and soooo quick to make. Loved it! Thanks Diane! Great flavor.... but definitely needs something else... it's all fruit. Try adding yogurt, ice, or juice. This recipe is fun,easy and fast! Plus, it tastes wonderful! I really liked it, but I cut mine with some milk and another time with Yogurt. Outstanding recipe. Great plain or try it over ice cream without the honey added. Smoothies are the best because they're fast and easy to make- this one is especially good since it has only 3 ingredients! Very fruity and tasty. this recipe is very good for the staff lunchon my foods2 class is holding for nov.17th.